Keep receipts for your golf sticks to help with a claim if they're lost or stolen. It is easy to travel with a "golf stick" -- which is synonymous with "golf club" -- on an airline. Just don’t expect to carry your stick into the passenger compartment. Airlines and government agencies have strict rules against allowing golf sticks as carry-on items. Your prized sand wedge is perfectly acceptable in a bunker on the golf course, but on an airline it could be used as a deadly weapon, and that's one reason you can't carry it onto the plane. The Transportation Security Administration, a U.S. federal agency, prohibits golf clubs as carry-on items, according to its website. There are no exceptions, even if your club is a prized antique or has some other special significance. Even if you have the club in a box, security officials are usually certain to spot it as it passes through the X-ray machine. Airlines do allow golf sticks as checked baggage. You must store the club in a suitable container, such as a box or golf travel bag. 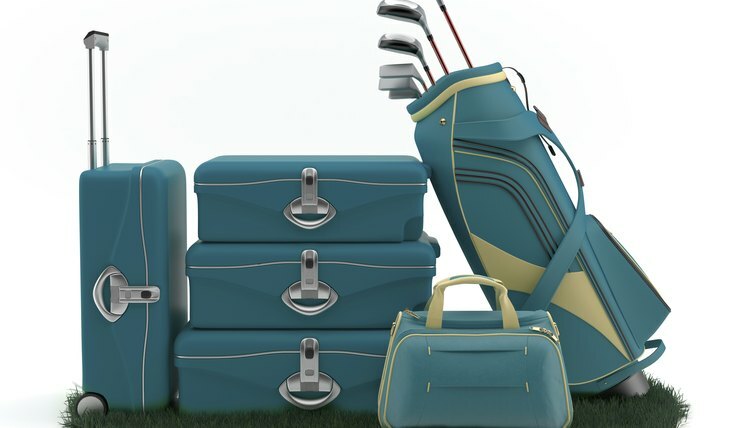 Some golf travel bags are large enough to accommodate a full set of clubs, along with golf shoes and other accessories. Most airlines treat properly packed golf clubs the same as other checked luggage. Standard fees for checked bags will apply to the golf clubs in most cases. Check with your airline before taking a trip with golf clubs. The airline may charge an additional fee if your packed golf travel bag exceeds a certain weight, for example. The airline may also suggest that you pack your clubs in a hard travel case. Some golf travel bags feature soft materials that may provide less protection than hard cases. The airline might not accept responsibility for damage to your clubs during transit if you ship them in a soft-sided bag. Ask your airline for details. Another option is to ship your clubs using a courier service. Most companies offering overnight delivery of small packages also will deliver your golf stick or an entire set of clubs to destinations around the world. With some planning it is possible for you to have your favorite golf stick waiting for you when you arrive at a golf resort or hotel. Lots of golf travel bags look alike, so make sure you properly identify your club when retrieving it at baggage claim. Gain added protection in a soft-sided bag by wrapping a towel around your driver’s club head. Also check all zippers and latches on your travel bag to confirm that they are working properly.